Who Else Wants an Easy-Peasy Content Marketing Strategy? 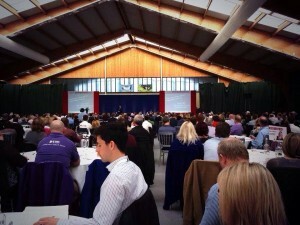 Yesterday, I was at Basingstoke with around 700 other small business owners getting inspired by the Entrepreneur’s Circle. Anyway, what always strikes me with events such as these, is the amount of ideas you come away with. As a small business owner, organising your marketing plans to get them implemented is a key challenge – especially when you have budget and time constrains to think about. Sales letters, blogs, newsletters, autoresponders, advert etc. Writing stuff so you can stay on your customers’ radar is super-important. But if you’ve got limited time and a limited budget, where on earth do you start? If you’re struggling with just this question, unless you make a firm decision, you’ll either end up trying to implement too much at the same time and make a big hash of it OR get so tongue-tied and tangled, that you end up doing nothing. And that’s no good for anyone – especially your bottom line. The first step is to get clear on what you’re trying to achieve. Try to visualise you and your business having already achieved your goal and you’ll know what’s most important to you. If it’s more sales, you need to focus on sales material. But if it’s more authority, you’ll want to invest more effort creating positioning and reputation-building content. If you work by yourself, you’ll struggle to do all the above well. So the next step is to look at your budget and your time constraints and decide which one thing is the domino. What I mean by this is, which ONE thing do you think will have the biggest impact in the shortest amount of time. When you as this question, what you’ll often find is there in ONE thing on your list that can act as your accelerator to kick-start your progress. And once you’re going, you’ll create the momentum you need to take you towards your goals that much quicker. Once you’ve decided where you’ll start, make it happen. If it’s sales letters to your existing list to promote a particular product, create the time in your schedule now when you will write them. In addition, decide a timescale. Without this, you’ll find the task will have a sneaky way of absorbing all the time that you give it! In addition, don’t feel you have to do everything yourself. You may find it’s more cost-effective to get someone to help you, especially if writing is not your thing. Once you’ve implemented, you need to step back and review and reflect on what happened. What results did you generate? What would make it better for next time? Is there something else you could try etc. By implementing one thing, you have taken a step closer. You may have earned some money which will allow you to invest in something else on your list. Whatever that may be, it’s now time to build on those successes and keep pressing forward. Yes, I know that it can feel relentless at times. It can also feel that you’re not getting anywhere because there is always more to do. BUT, remember this. Implementation is the secret that closes the gap. Getting stuff done is what’s going to take your business from where you are now to where you need to be. As a business owner you have the freedom and flexibility to create anything you want. Simply tap into your creativity, ensure it benefits your customers and communicate your offer in a compelling way and anything is possible. I’d love to know what you’re up to, so why not leave a comment below or drop me an email to georgina@gemwriting.co.uk. Hi Georgina. Thanks for another thought provoking message. I have lots of ideas about how to market the business and who to market to, BUT it’s my partner’s business (I’m the unpaid help!!) and to be able to progress productively, I need him to answer me your first question – Big Picture Thinking. I need to know where he wants the business to be. If I ask like that, he just says earning more money… not which area of the business he would prefer to develop, or how much money he would like to earn. And it’s not like he hasn’t heard of SMART objectives! Any suggestions for subtle questions that will get me the answers I need??? Hi Suze, thanks for leaving a comment and for your great question. I do think it all starts with Big Picture Thinking. If you can start to visualise and create a destination that you want to take your business, and a vision that you want to fulfil, you’ll have a benchmark against which you can assess your plans and ideas to determine which are likely to be most effective. I think it’s fine to aim for more money, however, you do need to quantify what that actually means. If you can create a target for monthly profit that you’d like to generate, and then compare that to where you are now, you’ll identify your gap. You can then set about closing that gap. You could break it down even further. To close your shortfall, how many new customers do you need? How much do you need to increase your average customer spend by? How many sales do you need to make? Again, with this information, you can then start to think about the sort of marketing strategies that are going to help you move from where you are currently, to where you want to be. If it’s a case of increasing average customer spend, could you introduce a premium product? If you need new customers, could you create a cracking offer and then write a sales letter to your database? Let me know how you get on, and best of luck. Reflect and Review, I think that is the one I am probably guilty of not doing thoroughly, the other bits always seem more fun! Hi Fiona, it’s tempting to do that isn’t it – (And I’m a little guilty of that too with my own marketing) especially if you’re a creative ideas sort of person. However, the problem with not taking that step back is you may have created an awesome gem! But if you don’t realise it, you can’t capitalise on that success.